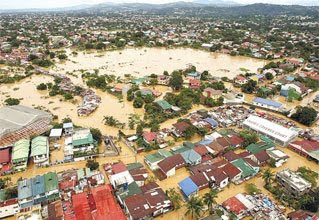 Most of the areas in Metro Manila are ravaged by flood caused by the Tropical Storm Ondoy, international codename Ketsana. As of today, the entire Metro Manila sank for the first time and the houses are submerged or engulfed in floodwater. According to weather specialist Mario Palafox, the amount of rainfall recorded from 8 a.m. Saturday to 8a.m. Sunday at the PAGASA Synoptic Station at the Science Garden in Quezon City exceeded the previous record of 334.5 mm rainfall documented on June 7, 1967. Palafox said that in a span of six hours, the amount of rainfall on Saturday, was at 341.3 mm, was comparable whole day rainfall recorded in the past. At around nine hours, the record reached 410.6 mm. This record already exceeds that of 1967. In Cebu City, the central part of the Philippines, strong winds and occassinal rainshowers can be felt and people are advised to refrain from going out specially those living in shanties, to avoid untoward incidents. The City Government of Cebu already gave around Php 1.7 million financial aid. There are also rescuers on standby just in case they're needed but they're not yet sent by the mayor . The mayor argued that the seat of the national government is in Manila and that they can take care of the victims. They might be needing the rescuers if something happens in Cebu, according a newspaper report in Sun Star Cebu. Sun Star also set up a special helpline webpage to help Ondoy victims. You may visit the site here. For donations, you may donate via paypal here or by using the button below. The City Government of Davao will offer relief assistance and donate food to the flood victims in Manila. Their mayor, Mayor Rodrigo Duterte will set aside their budget which is intended for his weekly television show "Gikan sa Masa, Para sa Masa" (From the People, For the People). "We will donate the money for the celebration of Gikan sa Masa to the flood victims. Dili ko ganahan mag-party, ihatag na lang nato ang kwarta sa Luzon (I'm not in the mood to party, just give that amount to Luzon)," Duterte said. President Arroyo opens Palace for "Ondoy" operations. Defense Secretary Gilbert Teodoro said Arroyo declared a state of calamity in Metro Manila and other storm-hit provinces, allowing officials to utilize emergency funds for relief and rescue. The NDCC has declared a state of national calamity in the NCR, Mt. Province, Ifugao, Benguet, Pangasinan, La Union, Ilocos Sur, Isabela, Quirino, Nueva Vizcaya, Aurora, Nueva Ecija, Zambales, Pampanga, Bulacan, Tarlac, Bataan, Cavite, Laguna, Batangas, Rizal, Quezon, Occidental and Oriental Mindoro, Marinduque, Catanduanes, Camarines Norte and Camarines Sur. An estimated PhP 109-million (around US$2.3 million) worth of infrastructure and an estimated PhP212,500 crops are damaged. The number of casualties reached more than 100 and around 32 are missing. 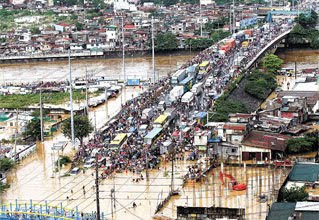 Ondoy swamped entire towns, collapsed bridges, engulfed or submerged an estimated 50,000 houses and establishments and shut down Manila's airport for several hours. Almost 300,000 individuals are affected. Monday classes are suspended in elementary and secondary levels.